Demandware now Salesforce Commerce Cloud platform offers AI-powered commerce which helps collect real-time behavioral data to find out customers’ needs at a deeper level, and anticipate the items they are most likely to buy. AI embedded Commerce Cloud Einstein empowers us to reduce manual merchandising tasks and create a true one-to-one personalization. Commerce Cloud Einstein facilitates data-based decisions and grows smarter over time, so we no longer need to depend on demographic data as our only source of truth. 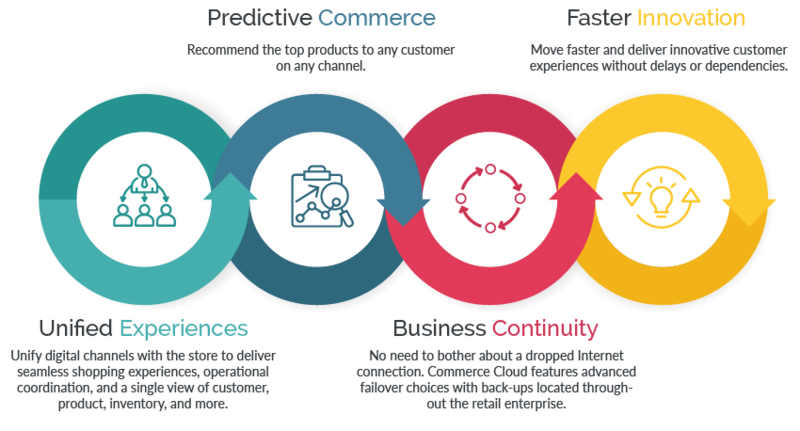 Moreover, Salesforce Commerce Cloud now provides Customer 360, a 360 degree view of the customer. Customer 360 assigns a distinctive ID to each person so it can stitch together multiple records of that person across different systems. Salesforce Commerce Cloud empowers the world’s leading brands to unify customer experiences across all points of commerce. Salesforce Einstein immediately begins to assemble data on customer interactions like what products they look at, what kind of content they read, and what they put in their shopping cart then automatically catch any difference in behavior. This gives us more insight into that customer’s interests than just where they live etc. Royal Cyber has seasoned Demandware consultants to streamline your eCommerce site. Royal Cyber has substantial experience in working on cloud platform e.g. migration and implementation.